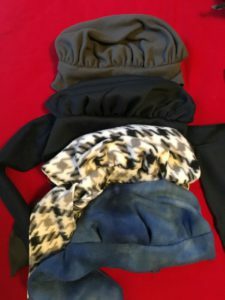 I had found a couple of hat patterns, Kwik-Sew & McCalls. I think I might have mentioned that. Light weight polar fleece does really well as soft, warm and flexible. However, there were a few challenges. Most of the patterns called for multiple extra seams, double layers of fabric or a lot of fussy finishing details. Me? I am about quick and functional. And not wasting fabric, I really should mention that as well. Using a knit fabric with give is quite a bit different than sewing with a woven fabric. The idea of making anything that might need ironing is just not compatible with being on board a ship. 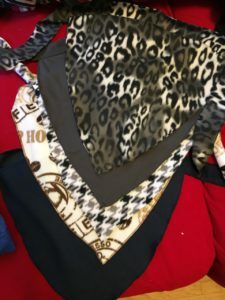 After working my way through the patterns, I have wound up with the Scarf from Kwik-Sew (which of course I went looking for on their site and couldn’t find. Go figure – JoAnn’s had it) and M6521 from McCalls (along with M4116) gave me a good range of choices. Light weight sweatshirt fabric is lovely as is micro-fleece. I’ve pretty much stayed away from patterns in order to have a wider range of use. But I couldn’t resist my owls, and a bit of what might, with a good imagination be considered a leopard variation. Since I survived several days of jungle cat decedents I felt I was entitled. So I guess this means scarves, hats and muffins for breakfast on ship. Very stylish! And avoiding attaching fake flower rosettes. There’s an idea. I have enough after my lavender fleece coat (Simplicity 1540 made longer) for a matching hat. Does Mrs Claus wear lavender?